The re-opening of this town favorite bakery was a pleasant surprise. Their cakes and buns are really delicious. They have lots of choices and are well stocked. Shhhh....Best kept secret for 50 years! I usually stop in Fritzsche's on the way home from playing nine holes, to pick up some buns for a late breakfast. All baking is done on premises and out of this world. 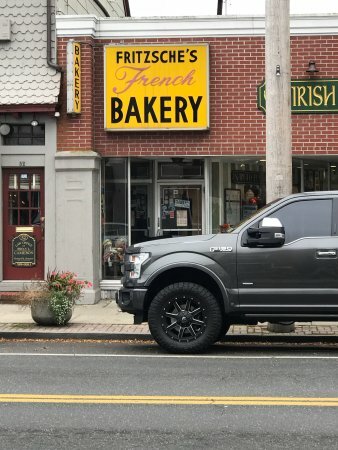 Waiting on line on Sunday mornings for Fritzche's rolls, croissants, doughnuts and buns is well worth it. They're menu is limited. You won't find apple or blueberry pies, but what you will find is the best of the best! Had the opportunity for a free Saturday (not a common event). Told my wife...' before we run out east today..I need sustenance...Ha ha". First stop...of course Fritz'es!!!! If you live our town...you understand...if not ...you're missing out!!!! Get quick answers from Fritzsche's Bakery staff and past visitors.